"Who is your classic movie star doppleganger?" 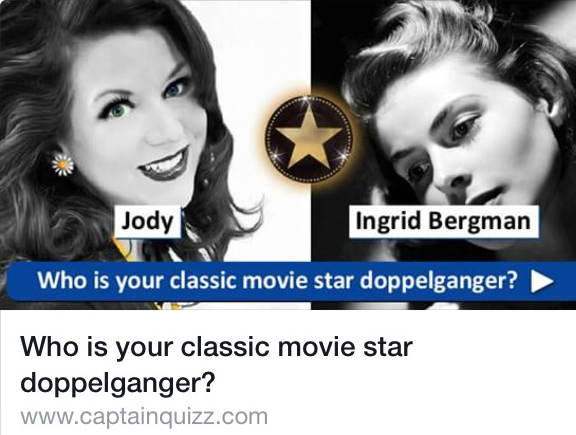 I typically ignore the countless "quiz apps" that periodically float around on social media, but given my love of "Old Hollywood" style, this one piqued my curiosity. I was surprised at the result, though it's obviously based solely on some reasonably clever algorithm that identifies certain similarities in social media pictures of the subject and archived photographs of a small library of historical figures. I can see why a non-human app would select this particular photograph of Ingrid Bergman to compare to my black and white headshot, but I don't actually bear much resemblance to the 1940s star most most well-known for her role opposite Humphrey Bogart in Casablanca. 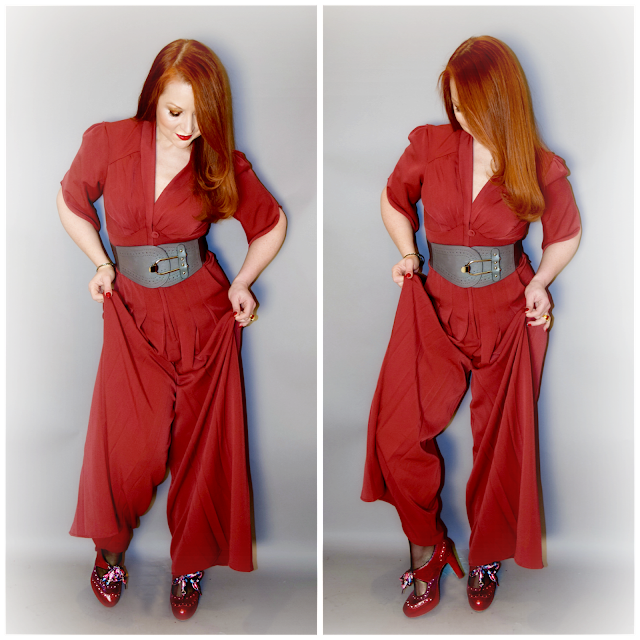 The jumpsuit came with a narrower belt in the same fabric and color, but I preferred the contrast of a wider belt in dark grey to break up the otherwise monochromatic look. That said, I do admire her style. 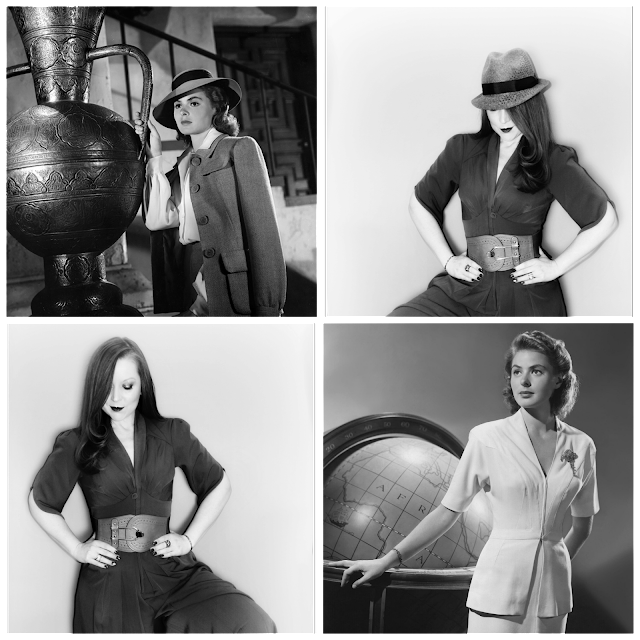 And coincidentally enough, just a few days prior to taking the "doppleganger quiz," I sported my own, updated version of a classic 1940s look similar in details to some of Ms. Bergman's classic wardrobe pieces. 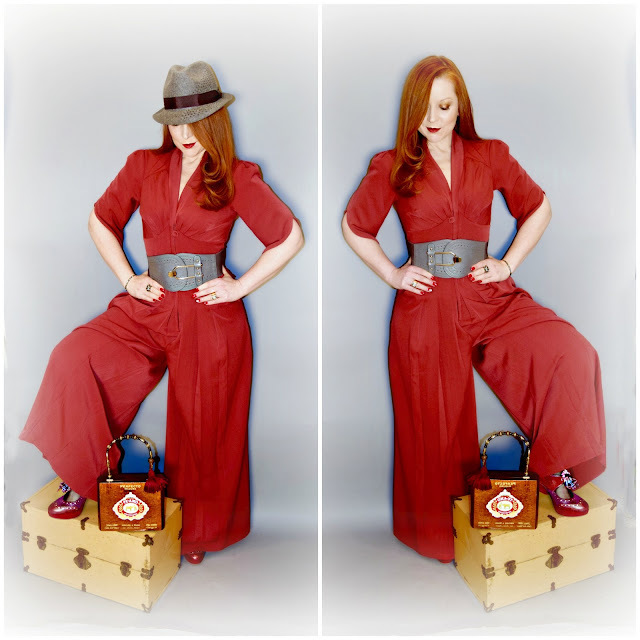 The jumpsuit was first popularized in the World War II era (a la Rosie the Riveter), and this one by Swedish line Miss Candyfloss deliberately echoes the past in its tulip sleeves, V neckline, bust darts, and voluminous legs. In fact, it looks as though it might have been modified directly from this vintage 1940s pattern. There are definitely similarities between Ingrid's Casablanca wardrobe and my current day retro look. I like wide leg pants, though these verge on being too voluminous. They're about as far from skinny jeans as you can get, and are not for the fashion timid. This hat has been one of my Winter staples. 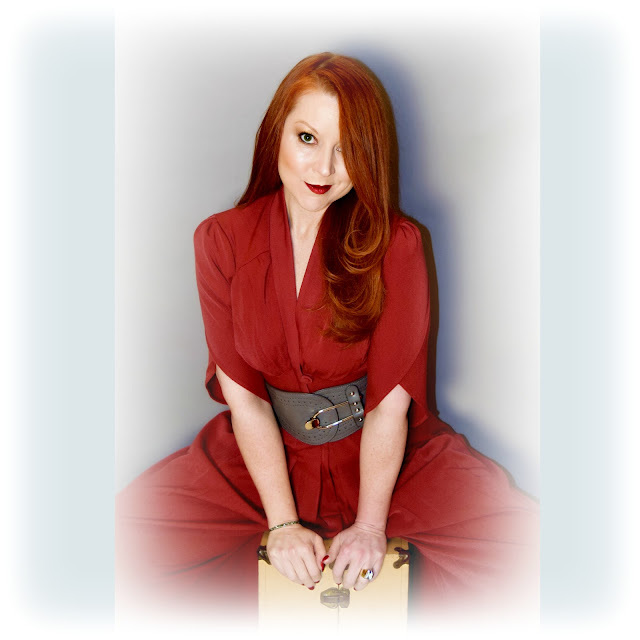 I found it at local Indianapolis boutique Marigold Clothing; The purse is a vintage find made from an actual cedar lined cigar box - it smells divine every time I open it; The suede spectators from Poetic License also have a vintage feel. They're a favorite pair. I am a lover of jumpsuits, and you wear this red beauty with panache. Love the wide legs and the hat that you so generously shared with Hat Attack.